Vampire Knight can increasingly be summarized with one word: confusing. The plot is confusing - who is good or bad; what's going on? The characters are confusing - who is who - it's hard to tell people apart. And yet, I keep reading and mostly enjoying this series. I like that Yuki is coming back to be the strong girl that she started out the series as. She lost her way when Kaname first changed her back into a vampire and revealed her history. We saw Yuki's strength really emerge in Volume 15. It's more subtle in this volume, but Yuki seems increasingly sure of herself, even when she's not sure of Kaname or exactly what's going on around her. But really Yuki took a back seat in this volume. Much of the volume is about Headmaster Cross going after Kaname himself. Headmaster Cross is a fascinating contradiction. He's a vampire hunter but a man devoted to peace. He came across as silly at the beginning of the series but is increasingly serious. He went from being Yuki's virtual father to being a near stranger and is now becoming involved in her life again. The other main plot arc is the blood pills that Sara's company developed. Yuki suspects that something is wrong with them and she's right. They make vampires who take them forget their dedication to peace and cooperation. Sara's trying to make slaves, either people who will serve her directly or indirectly by creating chaos. Sara has gained a lot of power at the school in a short period of time, but people are beginning to catch on to her. The major development in Volume 16 is not so much a development as a question. What is Kaname doing? Of course, we've been wondering that for a long time, but after a few volumes where he seems to be pure evil, there's a hint of doubt. Yuki realizes that Kaname did not commit a few murdered which were attributed to him. That's not to say he didn't commit others, but it opens a door to see some layers to whatever he's doing. I'm sure curious. And that's what keeps me coming back no matter how odd this series is. I agree with you, Vampire Knight is starting to get confusing. Boo to the confusing, though. Maybe it'll get back on track and clear things up with the next one! 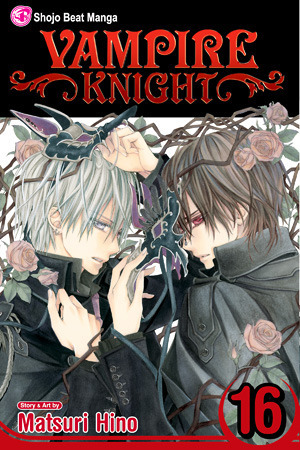 Though Vampire Knight is really popular, I've never found myself attracted to reading/watching it. I know the basics sure, and sometimes I read the latest chapters just to see where the story is going. I suppose saying it's "confusing" for me too would be useless though =)) Still, I appreciate the mangaka's art style. I reviewed this one today too! There are definitely lots of questions than answers in this book. I really want to know what Sara told Zero! Do you think it's possible that Kaname will get rid of *all* vampires for good? Still hoping that Yuki and Zero get a HEA! I also found Vampire Knight becoming confused as the manga went on. It's one of the reasons why I stopped reading it. Especially with the whole Yuuki and Kaname situation. I heard it was ending soon though so hopefully everything will be unconfuse soon. Noooo. I want to read it, but I don't want to read the spoilers. Waah!!! I am a few volumes behind, but I love this series. I have a VK calendar up at work and this month is Kaname. Yummm. Once I get Christmas put away, don't ask, I plan on reorganzing my books so I can get to those books that have been buried for months or years. I'm not even sure at this point where I left off. Maybe Vol 10? this is one of my favs! i love the pages with yuki and zero. i just couldn't stop looking at them. i love that Cross is really an amazing vampire hunter, what fun character twist that we are finally seeing revealed! and check out that cover! so hot! i think it is my favorite cover to cross a manga. and yes the story is confusing, but i don't mind re-reading to try and understand it better. it also keeps me wanting to read and questioning what is kanama-sama up too. i trust him and don't you love it when you start to not trust him anymore?